When you plan your holidays in Germany you need answers to many questions. 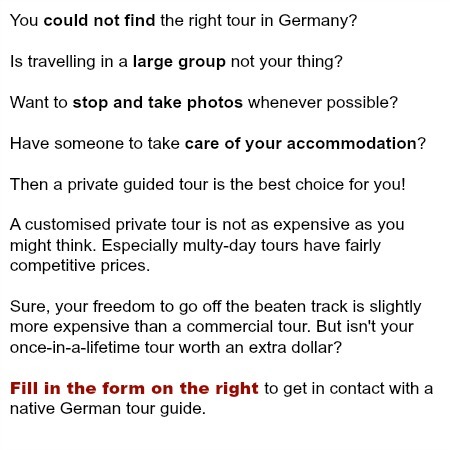 Where do I get German tourism information? How can I travel independently? How to find the best guided tours in Germany? I am happy to give you answers and help you to plan your vacation in Germany. There is a lot of information on this website, just check the "Planning" section on the top right. When you plan your trip, please remember, there is so much to see and do in my country, it is impossible to include all attractions into one German vacation. Do you want to tick off the most famous sights like Neuschwanstein, Heidelberg, the Rhine Valley and the big cities? Or are you looking for the hidden gems, places where the locals spend their holidays in Germany? When you are exploring Germany on your own you will certainly discover your personal favourite sights, places you have not heard about before. However, when you are short of time joining a guided tour can help to make the most of your German holidays. 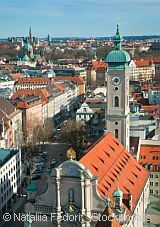 In this section of the Germany Facts Guide I introduce you to city tours and guided tours that take you from major cities to the lovely countryside. Come on, let us discover what is in store for your vacations in my country. Use the quick links below to jump to a tour in a particular city, or get info about customised tour offers. A visit of "Father Rhine" is a must for your holidays in Germany. 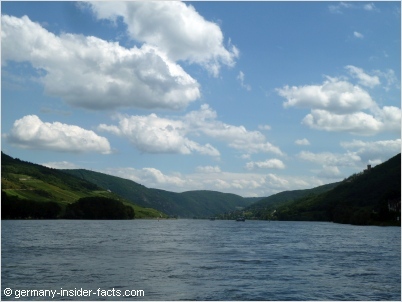 The picturesque middle Rhine valley between Koblenz and Bingen is on the Unesco World Heritage list. Join a river cruise to see the best of the Rhine River. 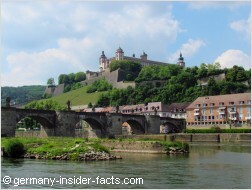 The big advantage is... you will see the majestic castles and ruins on both sides of the Rhine. Because the middle Rhine Valley is fairly narrow, you'll hardly see much on the side you are travelling, when you go by train or car. On a river cruise you actually enjoy a 360° panorama. Travel on a paddle steamer along the most picturesque section of the Rhine valley. Explore famous Rüdesheim before you return to Koblenz. Departure: From the Koblenz Pier at 9:00am. The cruise departs daily from late March to early October. Duration: 11 hours. Tour finishes at Koblenz pier at 8:10pm. Tip: If you don't want to spend all day on the river, you can use this tour as one-way journey from Koblenz to Rüdesheim. Want to see as much as possible during your vacations in Germany? A one-way tour, from Frankfurt to Munich for example, takes you from the busy Rhine-Main metropolis to the capital of Bavaria and the fairy-tale castle Neuschwanstein. 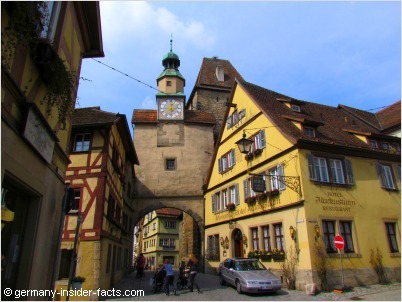 Travel by coach from Frankfurt to Rothenburg ob der Tauber. The picturesqe town is known as the jewel of the middle ages. The tour continues along the Romantic Road on the second day. 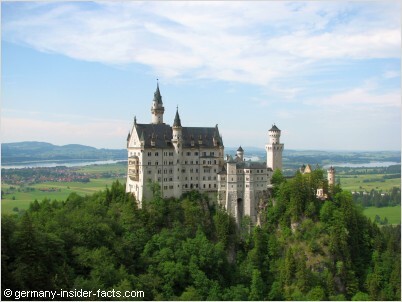 Visit Neuschwanstein castle, the famous palace built by Bavarian King Ludwig II. Departure: From the train station, Frankfurt at 8:00am. This tour runs daily from April to October. 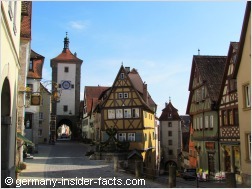 Duration: 3 days / 2 nights, with accommodation in Rothenburg ob der Tauber and Hohenschwangau. Arrival: Tour finishes in Munich at approximately 7pm on the third day. Tip: This tour is also availabe in the other direction - from Munich to Frankfurt. 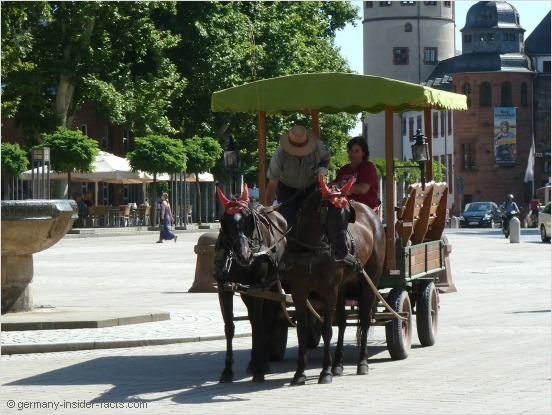 Visit the most famous attractions on this relaxed tour through Germany's lovely south. Travel along the Romantic Road to Rothenburg, see the Zugspitze (our highest mountain), visit King Ludwig's fairy-tale castles Neuschwanstein & Linderhof, Oberammergau & Ettal. Then you are going to visit Lake Constance and Freiburg in the the black forest, Heidelberg castle and Rüdesheim. Overnight stops are in Rothenburg ob der Tauber, Munich, Füssen (2 nights), Singen and Heidelberg. This tour is called Romantic Germany, and indeed, you will see the most romantic places. This coach tour runs once a month from June to August. Click here to check the details of this stunning tour. You need different dates for this tour, or you want to visit other places in southern Germany? Contact our tour partner below for your own customised itinerary and travel dates. You can spend a week or more in the German capital and haven't seen all attractions. There is so much to do and to explore: history, nature, culture, and of course shopping! Don't know where to start with your sightseeing in our capital city? Here are a few tours to give you a start. This tour is the top favourite amongst Berlin visitors. 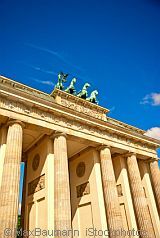 From Friedrichstrasse to Potsdamer Platz, Brandenburg Gate, Reichstag (Parliament) and the Holocaust Memorial, you are going to see Berlin's most historical places. Of course, the excellent tour guides tell you about the history behind the sights. This walking tour within one of the main concentration camps of the Nazi regime is a walk back into Germany's darkest part in history. The tour was researched by historian Gabriel Fawcett. You can expect that all tour guides have a deep insight into the notorious history of Sachsenhausen. Day Tour from Frankfurt to Neuschwanstein When you visit Frankfurt and long to see famous Neuschwanstein castle, this day trip is the right tour for you. Be aware that it will be a long day, though! Travel by luxury coach to Fussen, the lovely town that is close to King Ludwig's castles. Apart from the guided tour in the castle you have time to explore the beautiful surroundings of Neuschwanstein and take some stunning photos. Travel by coach to Würzburg on the river Main. Pick up a guide book at the tourist information and explore the city on your own. English-guided city tours are only available on Saturdays. Lunch at the famous Ratskeller and a guided tour of the baroque Residence castle is included. Travel from Frankfurt to the UNESCO listed Rhine valley. Enjoy a river cruise along the loveliest part of the Rhine Valley. See Rüdesheim and the Loreley rock (full-day tour). Munich itself is worth to stay for several days. Additionally, the beautiful scenery and destinations in the alpine foothills south of Bavaria's capital invite to exciting day tours to visit famous castles and towns. Visit the dream castles (Linderhof and Neuschwanstein) of Bavarian King Ludwig II and feel like you are in a fairy-tale. En route you have also a short stop in Oberammergau. You have four hours to explore the grounds of Neuschwanstein and appreciate the beautiful views. If you want to see the interior of the castle you can join an optional guided tour. Take a 1.5 hour train ride to Nuremberg, a town rich in medieval and recent history. Your guide is with you on the train and then gives a comprehensive tour through Nuremberg. See the impressive castle that overlooks the city, try the famous Nürnberger Roastbratwurst and buy a sample of the famous Lebkuchen. Want to visit the famous Oktoberfest? I've listed info about facts, history and the tents on the Oktoberfest in Munich page. Don't miss it. Hamburg has always been the place for people with "Wanderlust". When I see the big ships in the harbour, I get itchy feet and want to go on a big journey. This package is valid for three consecutive days, so you can pick parts of the package when it suits you best. Spend one day exploring Hamburg on the hop-on, hop-off bus at your own pace. Take a harbour cruise the next day at 12:00noon. A tour on the "harbour to the world" is very exciting and shouldn't be missed. Finally the Alster Lake boat trips depart every 30 minutes from 10:00am to 6:00pm. 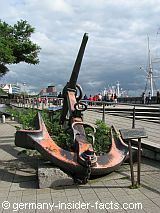 This Hamburg Combo is the best deal for first-time visitors to get an overview of the highlights of Germany's second largest city. There are many more tours available than I can ever provide on my website. The tours I select are the best deals, in my opinion, get great visitor reviews, and include many of the "must see" places. However, feel free to compare several online booking services yourself. Enjoy your holidays in Germany, I know you will have a wonderful time exploring my home country. 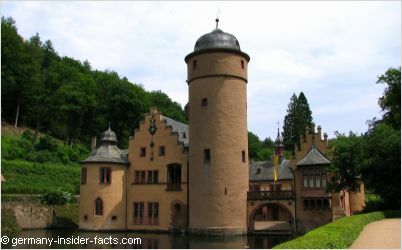 Discover more Germany tour options and attractions, don't miss these related pages.